The UVM Browser View is an intuitive entry point for exploring all the classes of a UVM-based verification environment. 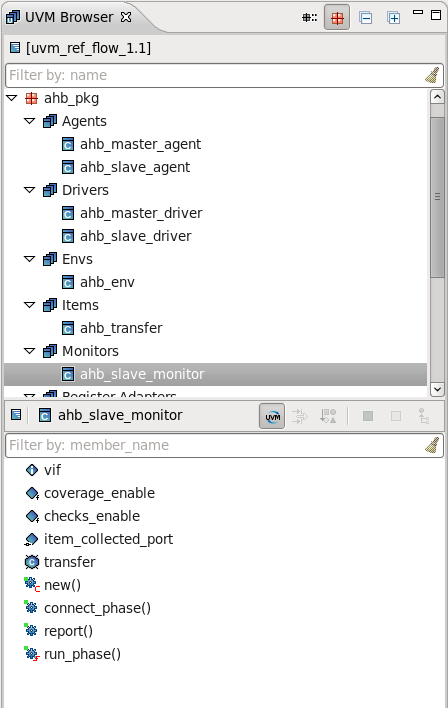 It allows you to explore UVM-based classes grouped by categories, like agents, monitors, drivers or sequences and easily inspect the UVM flow specific API, like overridden phases, class members registered to the factory or TLM ports. Open the view from menu Window > Show View > Other... > DVT > UVM Browser. Prepend Package Name Prepend the enclosing package name to the name of each class, useful when you explore for example all agents across packages. Group By Package Group classes by package. You may chose to see for example all agents across packages or to explore all categories in a specific package. The top UVM Types Panel presents all the UVM-based classes defined in your verification environment. For convenience they are grouped by categories like agents or monitors. The inheritance hierarchy between classes is shown up to the UVM base class. Class is declared under a different package than the parent package presented in the view's tree because one of its children are declared under that parent package and "Group by Package" is enabled. Physical sequencer or sequence. A physical sequencer is a sequencer that is connected to a driver. A physical sequence always extends uvm_sequence parameterized with a class that extends uvm_sequence_item and contains `uvm_declare_p_sequencer macro with a physical sequencer as argument. Other Components uvm_component Any class deriving from uvm_component which does not fall into any other category within this table. The bottom Members Panel panel displays class members. You can toggle the UVM Members Mode on/off using the button. When the UVM Members Mode is off, the Members Panel behaves exactly like the Members Panel of the Type Hierarchy View.